Dynisco in the US, these screen changers feature a patented pressure actuated seal that allows processing of polymers up to 600 degrees F. The seals are designed to be accessible through the slide plate opening, allowing replacement with no machine disassembly. Also, a multi-position handle design feature avoids interferences and allows for better operator access to the screen changer. Available close coupled extruder connections are cost efficient and save you money by eliminating c-clamp costs. 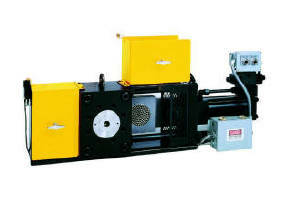 A range of models are available from 1" through 4.5" (25mm - 120mm), all with the capability of pulling the extruder screw through the screen changer while mounted on the barrel. to provide leak-free operation up to 10,000 PSI. sealing, improved reliability and easier installation. plate designed with 25% more screen filtration area. tamper resistant safety switches on the guards.